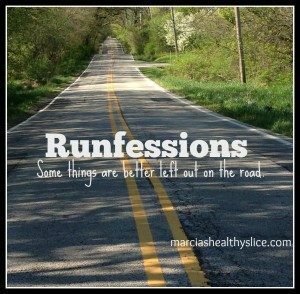 Runfession: I’ve been much more worried about my Achilles than I’ve let on, especially when I started to feel some thickening. I made the decision that I’d go see a doctor after the Half, and that day finally came this past Monday. The reason for my concern? While it wasn’t getting worse, it also wasn’t getting better. I first felt the strain when I was in Florida and blamed it on two 15Ks in four days, but it didn’t make sense as my Florida route was pancake flat. Luckily I work in a large-ish office with many of us on the same insurance plan, so finding a podiatrist was a fairly smooth process. I was able to get in the same day and she was amazing. She listened to my symptoms, did an exam and x-rays and confirmed what I’d been thinking: achilles tendonosis. Course of treatment? Physical therapy to improve my ankle strength and break up the scar tissue. Their office had in-house PT, but not one that I was in network for, but I had a quick referral to one who was able to see me Tuesday. You know those words that stick with you because their name makes them so memorable? Dactylography, Triskaidekaphobia. Dorsiflexion. 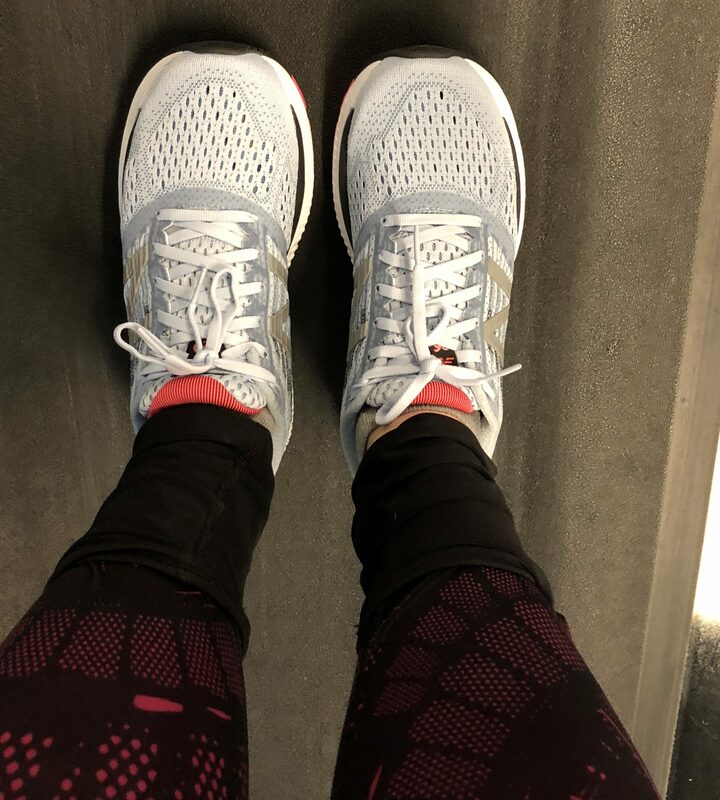 My 2019 goal of not getting injured is intact – I was already injured! Boo. 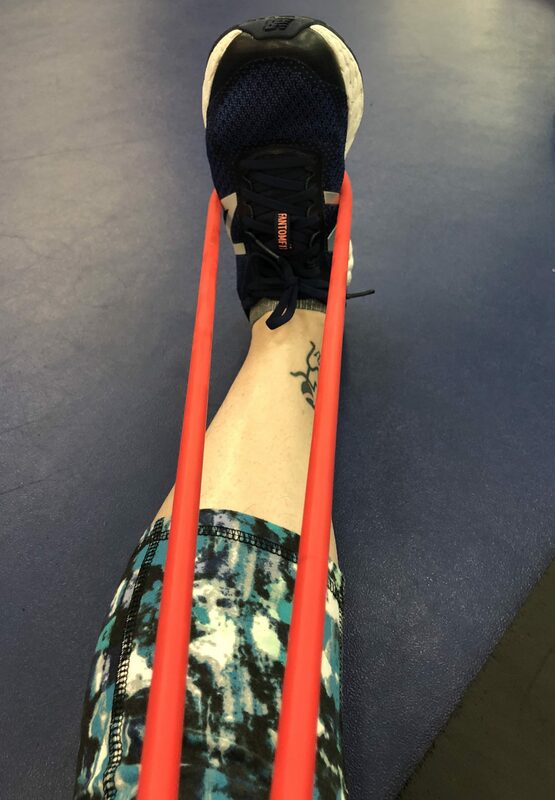 From their initial assessment, my bouts with plantar fasciitis are connected with this achilles injury, both stemming from my flat as a pancake feet. On the plus side, I don’t need to stop running or change my plans to run any of the 2019 races I have planned. There’s an app for that. 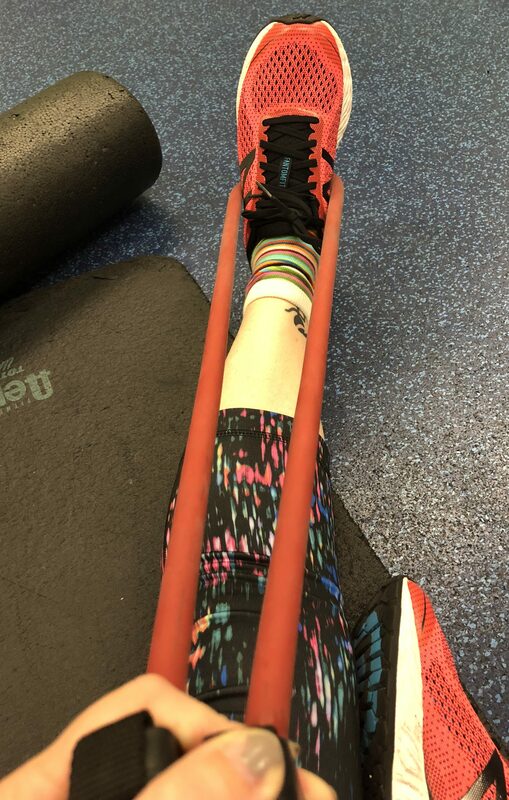 PT in 2019 is much better than 1997 and 2008 (both for my knee) where I had bad xeroxes of the home exercises. The app with my daily exercises includes a video that demonstrates them too. I see PT like I did Invisalign — it’s very different when you’re paying for it as an adult. I have been very good about wearing my retainer and will be compliant with my PT. The top photo is actually a resistance tube from the gym, but they gave me my own strap so I have no excuses. It’s too early to tell, of course, but I like the stretches and am optimistic. My appointments over the next three weeks are at 7 or 7:30 AM. When I (hopefully) graduate from PT the plan is to keep getting up that early and either go for a run, or get to the gym. Monday: 5K row between podiatrist and Monday Night Magic. Such a fun show, and dinner was Pommes Frites. How can you go wrong with any of that? 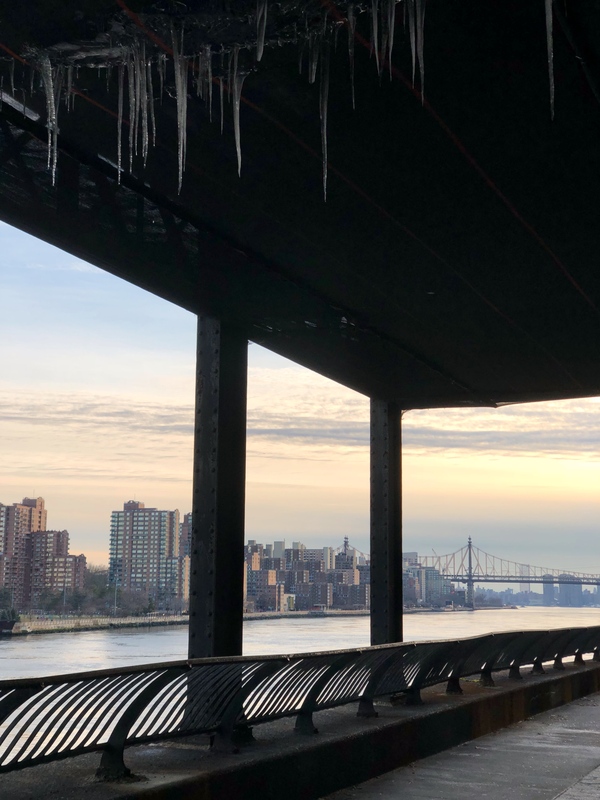 Tuesday: beautiful day, nearly 60 in NYC. 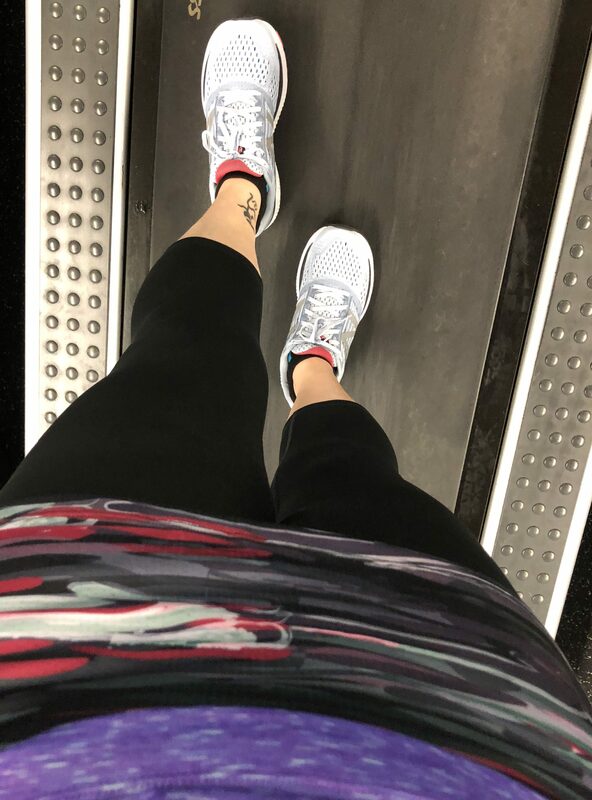 I had my first PT session and then headed to the gym for a short elliptical session before walking home. Can’t skip a gorgeous weather interlude when snow is on the horizon. Wednesday: off. Did not even get step goal. Not achilles related, more at work until 8 PM related. Thursday: office run group didn’t happen due to schedules. I thought we were happening so only brought outdoor pants (tights) which were more than a little warm in the gym. The shoes look white, but they’re more an ice blue with a coral/pink accent. This was only a short run as I didn’t want to push the Achilles-treadmill bothers it more. Shoes feel good and I’m antsy to take them out for a longer run once I know they’re a good option. so this is why I’ll never be a home owner? 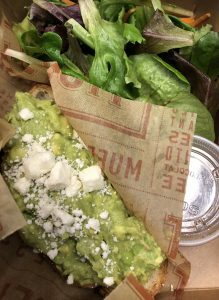 Friday: I’m not technically a millennial, but the avocado toast/real estate thing always makes me laugh. Love me some good avocado toast but rarely get it for lunch. I’m back on MealPal for February and it popped up today at ‘Tisserie. So good! After work, headed to the gym for a 5K row and my PT stretches. It’s too soon to have any real impact, but I love feeling the stretches in my calves. Another lovely feeling this week-I don’t “need” to go to the gym. I filed for the reimbursement and the next six month window doesn’t start until March 1, but I wanted to go. It feels weird not to go on days like Wednesday. That said, next week is crazy and I’m going to miss it more than I make it. Saturday: I wanted to run. I did not want to run outside with a wind chill of 20 when I had not prepaid and didn’t have to. But I wanted to run. Oh the arguments with ourselves. So I layered up and headed to the gym where I could give the new shoes another go and try out my new Lotta Breeze capris. They are definitely my favorite capri model. Best thing? No pain and went just a little longer than Thursday. Followed it with a short row and long stretch followed by some well bundled errands. Friday: fly to Florida; shakeout? Saturday: short run to beach? That’s good to hear. I’m willing to and have backed off after the Half – will do the same after FLL if needed. Want to have this resolved and not linger. Has yours fully resolved, or is that the shin issue you had last week? I’m so sorry you’re having to deal with this. I’m a medical person but the only word I recognized was dorsiflexion. What the heck are the other words? I hope the PT gets to the bottom of your issues so you can get moving again! New shoes are a good motivator! Sorry you’re dealing with all this, but it sounds like you’re got a good plan to get sorted out. PT’s are the best! I have never had any Achilles issues, but have heard how nightmarish they can be. OUCH! Hoping all the PT works its magic on you! I’m glad you’ve seen someone and an app – wow! my physio just emailed me the names of the things I have to do! And of course you’re OK to post even if you hadn’t run – there are loads of people in rehab on the Wrap. They only don’t want non-fitness related and ads and things. Everyone will want to see your progress. Now to eat. Midnight snack last night? Me? After running 15.5 in the morning? Could be …. I wonder if your PT is using Graston? It’s a metal rod, not a pizza cutter, but it can feel like one! It works wonders though. When I had PF I had to work on my dorsalflexion too. Ft. Lauderdale is going to be so great! I’m feeling optimistic for you – I always find things so much easier to deal with when they are no longer a mystery so I’m really glad they’ve established what may be going on. And a big bonus – that you can still run. What a relief! Is that a Half Marathon I see scheduled for Sunday? YES! It’s also reassuring that there is something wrong, it’s not just a mystery/phantom pain. The PT has been great. I am glad that you went to a PT to get to the source of the issue. It seems like you have a good course of action to treat this so that you can continue running. I am so glad you can keep running and not change any plans! PTs are magical and wonderful and Graston hurts so good! Hurts so good is the perfect description! Good to hear that at least you can keep running. I’ve had dorsiflexion issues in my ankle too – the stretches did help. Also, I’m wondering if your PT was using Graston – hurts like the dickens but makes a huge difference! Best of luck with your PT! You get an app for PT exercises? I can only blame myself for me not keeping up with my exercises. I find them so boring! I really need to be consistent. Crossing fingers for your half next week. I actually kind of like PT but no app! I wish they used one but they don’t. That would be super useful. I wish I had a masseuse & PT on call . . .
Masseuse. And housecleaner — I don’t mind the cooking, it’s the cleaning! Unfortunately I cook & I clean (and sometimes I still clean when Mr. Judy cooks, although he’s getting better at it — now, actually putting things back . . . a work in progress. I’m glad you went to see someone about your achilles!! this can be a tough injury if left too long! hopefully you are just in time and on your way to recovery. fingers crossed the half goes all right this week! i have posterior tibial tendonitis. my physio says there’s nothing I can do about it but get (new) insoles. my own fault, I decided to stop wearing my old ones in october. 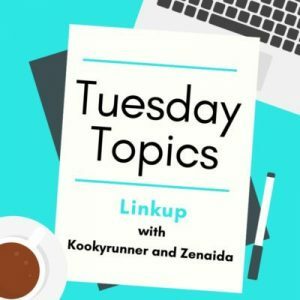 long story, too long for your blog space! either my physio is worthless or he’s right. I’ll know soon enough (pick up new insoles on the 21st). I hope the new insoles solve your issues — probably the cheapest solution, relatively? I think / hope I caught it on itme. Yes we are twins. I had the same diagnosis my 2nd year of running. 6 weeks of PT. Of course I stopped doing those exercises as soon as the pain was gone. It never reappeared. Hope the same for you. I did for awhile. Don’t remember when I stopped. My actual favorite is a random black and white one that I got off Poshmark. Style is discontinued as far as I can tell as I haven’t seen it, but this one is nice. I’m about to finally own Starlet thanks to the V-Day sale, and I am currently lusting over Bonita.